Things are good here on the Big Manistee!!! All 3 of us have been out guiding everyday and the fishing has been pretty good. Still catching fish in the holes and runs but there are some fish on the gravel doing their yearly thing. 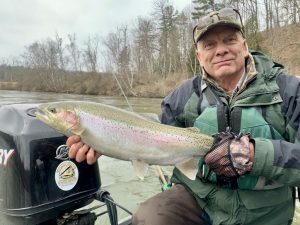 Seems to be a fair number of Steelhead around with some new fish showing up everyday due to all the water we have had. 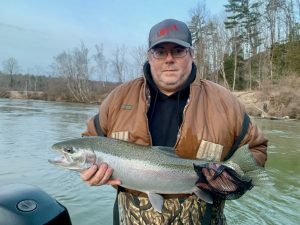 We have a very good mixture of Steelhead around at this time from chrome to blush and big to small and we have also been catching some Brown Trout for bonuses the last couple of days, you got to love it! Water temps have been rising a little bit each day. The river is high and stained and the flows have been up and down due to rain and snow melt from the last couple of weeks so who knows when we are going to see it start to clear. We have been mainly bottom bouncing but have still been fishing floats a little each day to get away from the crowds. Natural to bright bead colors and various nymphs all have been working. 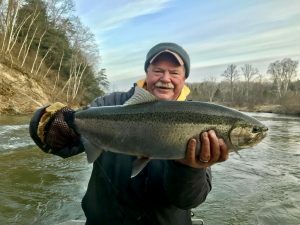 We do have a few scattered days open so give us a call if your looking to get out and enjoy a full or half day on the Big Manistee, Pere Marquette for Steelhead and Trout or possibly a Cast and Blast for Spring Chukar out at Thundering Aspens. We are taking bookings for Spring Steelhead and Summer Trout trips at this time so if you have a day or days in mind don’t wait long to call!!! If you would like to view more pictures check us out on Facebook @ Premier Angling Guide Service. Tight Lines & High Fives!!! The flows below Tippy are 3010 cfs the water temps are 42-43 degrees. Flows are up for this time of the year and the clarity is stained throughout the system. 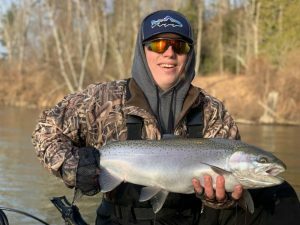 For the wade fisherman, the fishing above and below the coffer and down stream to the bottom of Suicide Bend has been good for Trout and Steelhead. Load your vest with all the tricks, Streamers, beads and various nymphs for the fly angler and Jerk baits and spinners for the spin fisherman for Trout. Spawn, beads and nymphs as well as jigs and wax worms for the Steelhead will all help you get it done. Think about the future of our fishery guys if you don’t need them then put them back. Help protect the resource!! Have fun and be safe, Bent rods and tight lines!! !